GARLIC BREAD & CAESAR SALAD!!! 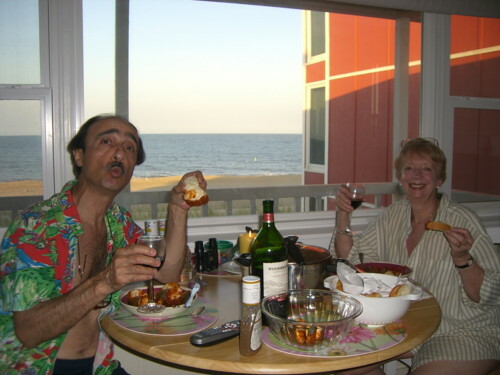 Our July 2014 traditional “Zuppa di Clams Night” at the Dewey Beach, Delaware, condo. But the “Zuppa Night” is not the only Dewey recipe tradition! And my obnoxious shirt, preserved only for Dewey Beach, is clocking some 25+ years (& looks it)! Excuse us for living, but most of you by now must have your own great recipe for garlic bread and maybe even Caesar salad. Our recipes for these gems were honed at home over the years. But these two recipes fell into our condo beach stay at Dewey Beach, Delaware, retinue of menus over the past seventeen summers there. Oh, we enjoy going to four favorite restaurants down there for our two weeks and trying a new one now and then. But most of all, we look forward to the three nights we have Happy Hour and cook together the Zuppa di Clams, Garlic Bread, and Caesar Salad. Pictured is one half loaf cut in half. Not for the faint of heart on the “garlic score,” but you can cut that back to taste. Usually we prefer an Italian bread or French bread somewhere between the large size/width pictured here & a Baggett. The Menu: Large steaks of your choice, preferably grilled, a generous bowl of salad of your choice to toss with a light dressing like a vinaigrette so you can have “seconds,” & all the garlic bread your heart desires! – -And plenty of dry red wine!!!!!!!! Cabernet Sauvignon? A Merlot? Pinot Noir? The Recipe: Use Italian or French bread of your choice that has a hardness to the crust. We like a width somewhere between a Baggett and a wide Italian bread, usually called French bread. Make 1 large loaf so you have leftovers. Slice the loaf first into two halves. Then slice the half loaf length-wise (as pictured above). Take a 2 cup measuring cup. Fill it with 1 3/4 cups of your favorite oil. We use Canola oil. You may like olive oil or any favorite oil will do. Using a garlic crusher (labor intensive now), crush 12 medium to large cloves of garlic. Cowards may cut back on the number of cloves. WARNING: DO NOT plan on socializing with other people for 2 days! Add the garlic to the oil and mix/stir. Add 4 teaspoons of oregano to the oil and mix/stir. Add 4 teaspoons of your favorite Italian grated cheese to the oil and mix/stir. We use Pecorino-Romano. Using a teaspoon, spread the mixture from the measuring cup over the open cut bread on both halves. Proceed cautiously as to have enough, pouring a teaspoon on the bread and then spreading it over the bread with the spoon. (Monitor your mixture and add oil, oregano, cheese, and even garlic if necessary.) Repeat this procedure for the other half loaf. Now put both halves of the bread together. Sprinkle the top of the bread with a little oil and cheese. 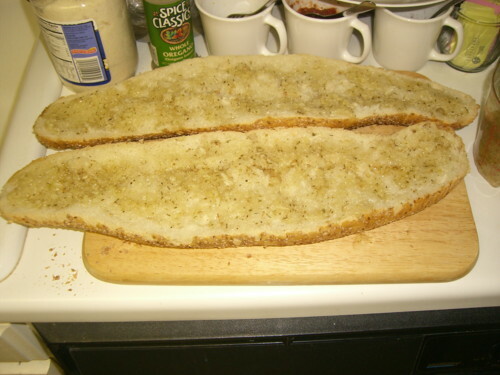 Cut the loaf into one inch or so slices. Slide the half loaf onto 2 pieces of tinfoil large enough to wrap the half loaf. Repeat the above procedure for the other half loaf!!! Heat each half loaf in the oven to serve hot in the tinfoil at the table placed in a basket. Need that second half loaf? Or save for a future meal! Perhaps our piece de résistance, this is our version of Caesar Salad. We realize there are many versions & ours differs from the traditional recipe, especially leaving out raw egg. The Menu: Large steaks of your choice, preferably grilled, generous loaves of Italian or French bread warmed, plenty of your favorite butter, & helping yourself to Caesar salad with abandon. (That means eat all you want and more!) – -And plenty of that dry red wine you like or try another!!!!!!!! The Recipe: Start with two very large heads of Romaine lettuce, using most of it, even the harder part of the leaf. Wash each leaf at the sink as you break it off the head and tear each leaf into large bite size pieces. Unless you have a huge bowl, throw the leaves into a large pot. Using that garlic crusher again (from the garlic bread! ), crush 8 medium to large cloves of garlic. You can cut back on the number of cloves here too (as with the garlic bread), but give this a try! – -So good! Again, DO NOT plan on speaking to people for 2 days! Add the garlic around the bowl/pot of Romaine as you crush it. Slice 15 large or 24 small green olives stuffed with red pimentos. Sprinkle them over the bowl/pot of Romaine. Optional: Dice into 1/4 inch pieces an entire can of anchovies. Picking up the pieces of anchovy, spread them over the Romaine. Pour the oil from the can over the Romaine. Throw the empty can into the bowl/pot!!!!!!!!!!!!!!!! – – Just wanted to see if you were still awake!!!!!!!!!!!!!! Disregard that last one! 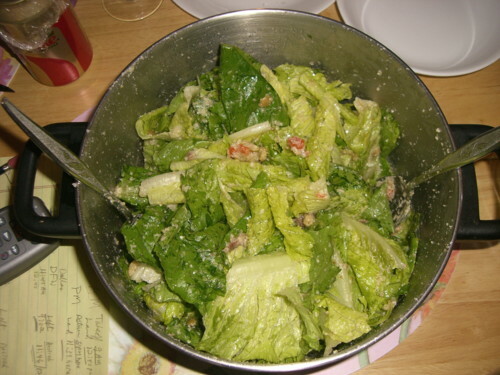 Top off the bowl/pot of Romaine: first, with 6 teaspoons of your favorite grated Italian cheese, spreading it all over the top of the Romaine (We use Pecorino-Romano cheese); and second, with 6 teaspoons of plain bread crumbs, again spreading it over the Romaine. Finally, as you are ready to sit down and eat, pour your favorite oil over the Romaine to taste. Do not overdo it, but pour enough oil so that the Romaine will be moistened with oil throughout. Again, we use Canola oil. You may prefer olive oil or some other. Now generously toss your Caesar salad with two large utensils; mixing in the oil, the bread crumb and cheese toppings, and all the ingredients! – -See if you can stop taking helping after helping of that Caesar Salad! – -Ambrosia! Excuse us for living, but there is no turning back after these recipes! Once we’re down in Dewey Beach, Delaware, the Zuppa, Garlic Bread, and Caesar Salad take over! And the beach is wide to the ocean and uncrowded so we can keep a safe distance from other people and still breathe! Well, you must come from Southern Italy…in Tuscany, we slice the whole loaf lengthwise and then cut it in half. Such a delicious post! I’m starving now! Can’t wait to try it out, thanks Phil! And I will certainly let you know when I try this recipe! OMG Phil! I never laughed so as when you said-” do not talk to people for 2 days”…that would be impossible for me…bwahahaha! I am curious tho-why do you use canola oil and not olive oil….???? You didn’t talk about the other essential – which wine(s) to serve. I think you should hook up with Amazon and they could overnight deliver to people like me. We don’t cook! If it doesn’t come out of a cereal box, a can, a microwave, or delivered to my front door, then I don’t eat it. Even boiling water is a pain in the bu**. We eat Caesar salad often too in the summer. Don’t have steaks with it though. And round here nobody would notice if we reeked of garlic! Great food and cool shirt. I’ve got a bunch of this type. They say they are tourist silliness but I think it is a cool Tom Selleck Hawaii look.